The Lion King and Simba's Pride Talking book Collectable is 105 minutes of original character voices, vivid sound effects and traditional songs. Young Simba is destined to become the next king, but when his father dies suddenly, Simba is forced to flee from the pridelands. The kingdom falls into the hands of evil uncle Scar. Under Scar's selfish rule, nature's delicate harmony is thrown out of balance, and it's up to Simba - now fully grown up - to return home and set things right again. Many years have passed since Simba became King of the Pride Lands and banished all of Scar's evil followers to the dry and desolate Outlands. But Zira, one of Scar's most loyal believers, has been grooming her young son Kovu to defeat Simba. One day Kiara, Simba's headstrong daughter and heir to the Pride Lands, meet the mischievous Kovu. 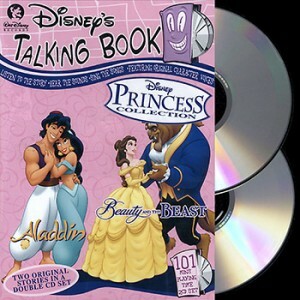 The rift between the Outlands and Simba's pride deepens as Kiara and Kovu's feelings for each other grow. 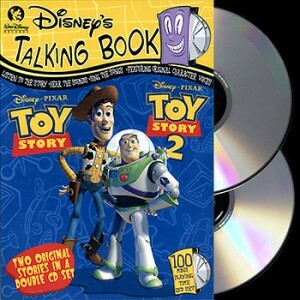 Will Kovu defeat Simba, seize control of the Pride Lands and become the next Lion King? 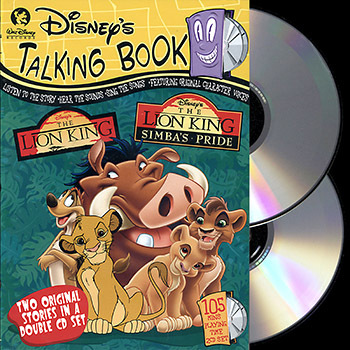 Click the button below to add the **LIMITED EDITION** Disney Talking Book - The Lion King & The Lion King Simbas Pride (2CD) to your wish list.